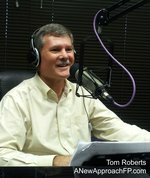 In this interview I talk with Tom Roberts, CFP. Tom is a fee-only financial planner with A New Approach Financial Planning. We talk about annuities pros and cons, as well as strategies for handling the ups and downs of financial markets. Following is a link to the interview with Tom, followed by a written interview. The podcast and written interview are somewhat different, so make sure you read or listen to both! It seems like the daily news from Washington is causing wild swings in the investment markets. With the budget stand off and upcoming debt ceiling discussion, should I be making any changes to my investments? Local, US and global news events always affect daily, short term, prices of investments. All types of markets are affected - stocks, bonds, oil, housing... Most of the time the best thing you can do is to sit tight. Remember what happened in May when investors thought the Federal Reserve was going to announce they were closer to raising rates? Bond prices took a large drop in one day. When nothing happened and everyone evaluated the real state of the economy, the prices came back within two weeks. I recommend that you have a game plan for your investments. That is you know what the goals are and how your investments support those goals. You will also know the amount of risk you can afford to take and where you will be uncomfortable. Periodically, once a year or so, you should evaluate whether it makes sense to change your allocation based on long term economic and market trends, as well as staying within your comfort zone. If you have allocated your investments to fit your plan, stick with your strategy. Timing the market is very difficult to do consistently. If you don't have your investments matching your plan, you can use market turmoil to adjust. For example, if you could use more stocks and the market is down, it may be a good time to buy. That sounds easy to do but it is difficult to watch my portfolio value vary so much. Do you have any ideas on how to ride through the rough spots? Understand your investments and stop watching so closely! The grandfather of modern investing, Ben Graham, said, "In the short term, the market is a voting machine. In the long term, it is a weighing machine." Meaning, on a daily basis traders vote with their buys and sells. In the long term, investors research and weigh the evidence to make a decision on an investment for the long term. If you are a trader, keep a close eye on the daily activities and buy and sell to your criteria. You do have criteria that you set up before you bought. Right? If you are an investor, evaluate the prospect, and buy when the price fits the long term plan. It is better to hold the right investments than worry about small price changes. Turn off the pundits - spend your time getting your strategy together and doing research. Look at how your investments have done over the last month, 6 months or year, rather than one hour. Disconnect from the noise. Take a walk. If you can't let go - reduce the risk level in your investments. If that won't get your the returns you need, you need to reevaluate your priorities. Ok, so I stop watching the news so closely. What long term trends should I be looking at now? Over the next 2 to 3 years, expect rising interest rates, slow economic growth, aging in developed countries, younger better educated people in growing areas of the world, and continuing high levels of political turmoil in the US and the Mideast. This leads to reducing your fixed income (bond) investments. The value drops when interest rates increase. Once rates stabilize, it will be time to rebalance to a normal weighting. When economic growth starts to accelerate, consider buying investments that will offset the effect of inflation - TIPs, stocks and growing market countries. Think about what people do as they become more educated and gain a little wealth. The first thing they do is buy some more comfort - better housing, food quality increase, use more electric power, travel more - motorized vehicles. Look at countries and areas that have these demographic and then industries that serve these markets for ideas. I also see the continued shift of responsibility and risk management to the individual. There are not many company pensions left and your costs are increasing for healthcare coverage. Social Security payments and other benefits are reduced based on income and other qualifications. It is more difficult to qualify for long term care and life insurance as companies seek to protect themselves against excessive risk. The message is, you will need to plan to provide for yourself. Don't rely on someone or the government, to do it for you. You may not be able to do it all but; you can do something to make your future better. How will rising interest rates affect your investment plan? When interest rates increase, the first things that will be affected are your fixed rate investments such as bonds and CDs. They will continue to generate the same interest payments, assuming they have fixed rates. However, the value of the investment will drop because market rates have risen and new bonds or CDs will have higher interest rates. This only affects you if you plan to sell these investments. If they have a long time to they are due, you will lose some because your interest payments lose value to inflation - which typically comes along with higher interest rates. If interest rates rise rapidly, companies that rely on variable rate financing or financing for projects will be negatively affected. They usually cannot raise prices or complete the projects fast enough to keep up with the higher costs. If rates increase slowly, there is often little effect as they can keep up with costs. If you are relying on fixed income investments for retirement income, you will finally get a break. As rates increase, you can move into less volatile bonds or CDs with higher payments. I hear a lot about annuities. Can you talk about some of the pros and cons? Annuities have a very bad reputation with some people. Some of the criticisms are deserved. Much of the fear and dislike comes from not understanding them or applying them to the right situation. In my opinion, annuities are first, a risk management tool. They are an insurance product. You should only buy insurance to protect yourself against a risk. Buy an insurance product to shift the financial risk to the insurance company. So, if we want to protect ourselves against potential stock market downturns but still have the ability to participate in the markets, an annuity might be applicable. For example, an Index or Fixed Index annuity can be set so you do not experience losses even if the stock market drops. Because the insurance company is assuming some risk, there will be the cost of insurance and the company will probably take some of the upside benefit. For example, your annuity value may be linked to the performance of the S&P 500 index. You are protected such that if the S&P 500 loses money over a time period, you do not - your return is 0. However, if the S&P 500 goes up 10%, you may be limited to a maximum increase of 70%. You also do not have the benefit of receiving dividends from the companies because you do not actually own the stocks. You are only "linked" to the S&P 500 index. The company takes the gain and income in return for providing you coverage on the downside. There are other types of annuities that can provide consistent income if you want to protect against loss of income every month for the rest of your life. You shift some risk to the insurance company but you still have to deal with the risk of inflation eating away at your buying power. If you want to have the company bear this risk, you will pay through lower initial payments that are increased to account for inflation. So those are some of the pluses. Are their any downsides to owning an annuity? These are some of the good things you can do with annuities. Annuities also allow investment growth to accumulate tax deferred. If you are in a high tax bracket today and expect to be in a lower bracket when you retire, this may be beneficial. However, you need to know that withdrawals taken from annuities are taxed at the earned income tax rate. If you held investments outside a tax deferred account and then sold them for income or took the dividends as income, most people would be taxed at a lower rate. If you are in the highest tax bracket, this may make little difference. But, if you are in the 25% or 28% income bracket, you will pay more over the capital gains rate of 15%. This is why I don't advocate buying an annuity when savings taxes are the primary reason. Two more things to consider when looking at annuities. First, when you sign a contract and send your money to an insurance company, it is an irrevocable contract (beyond the free look time period). That means you loose some flexibility by not being able to tap into your savings if you need it for an unknown event. Many annuities allow you to take a portion of your contributions out annually but there may be penalties if you take more or make a withdrawal before 59 1/2. You need to make sure you have adequate resources to cover potential emergency needs without getting into a penalty situation. Secondly, whoever bears financial risk will assume some costs and will demand a return. This happens to you when you buy and investment, you expect a return when you buy a risky asset such as a stock. The insurance company is giving you a guarantee and they expect an overall return over the entire group of clients. They do this by assessing fees, taking a portion of investments gains and restricting your investment choices. When you consider an annuity, first decide what risk you are addressing. Once you have quotes for products that will accomplish your needs, you can then decide if the costs are worth the protection. Sometimes this is difficult because the future is unknown and the risk may not appear for a long time. Like many other decisions in life, we are forced to make our best choice without having all the information. Take your time, find a trusted source, and understand what you are buying.